Why didn’t he just ride down 83rd Ave? The thing I appreciate about Brideshead Revisited, Evelyn Waugh’s novel of man who gets entangled in a family’s downfall, is that it’s a tragedy in the truest sense: all the ingredients of the last act’s misery are plain from the very beginning. As soon as you see how desperate the main character is to wrap his legs around a life of wealth and charm and wit, you can tell things are likely to end darkly. University of Alberta student Isaak Kornelsen’s death cycling down Whyte Ave this week was not inevitable. But if you bike at all in Edmonton, you can plainly see the ingredients there for tragedy. 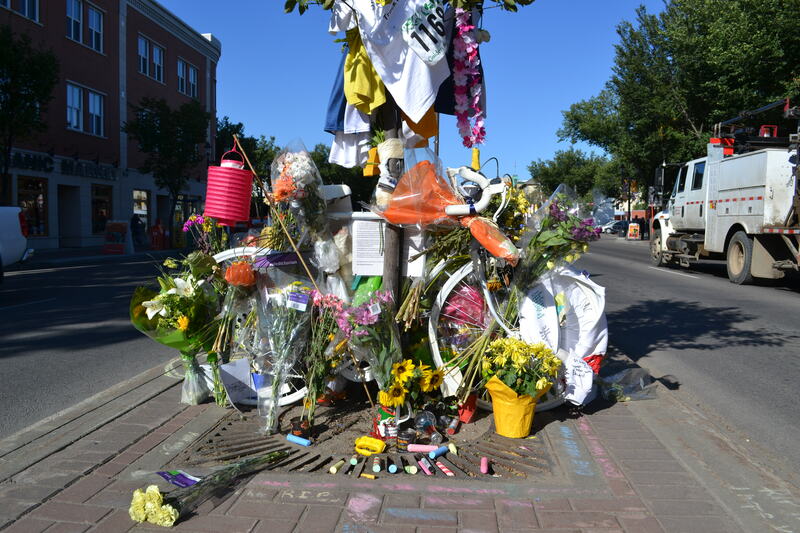 A memorial set up by the Edmonton Bicycle Commuters for Isaak Kornelsen on Whyte Ave this week. Isaak was riding his bike just a few blocks away from my house on August 27th. He was a cross-country and track athlete for the U of A Golden Bears, who’ve called him “a kind hearted and outstanding young man.” His family notes he was also passionate about his job serving and cooking at Café Mosaics on the other side of Whyte, and learning Swedish. Whyte — or 82nd — Ave is mostly known these days for cupcake shops and nightclubs, but of course it’s also a major commuter road for cars, bikes, and huge vehicles trucking goods across the city. According to police, Isaak struck a mirror on a parked truck, lost control of his bike, and was crushed under a passing cement truck. It doesn’t seem as if the cement truck driver intentionally struck Isaak, and in fact has said he didn’t even notice the bike had passed underneath him. But as soon as the bus driver asked this question, I felt like I could have guessed the answer. Why didn’t he just ride down 83rd Ave? Because it would have made no sense to use 83rd. It’s a confusing, narrow road that starts out one way, was blocked off during the Fringe, makes it difficult to see traffic from other directions, and doesn’t even cross one of the major roads that are its bookends. Why didn’t he just ride down 81st Ave? Because it’s blocked by a railway. Why not 84th? Another confusing road that’s partly one-way, blocked off by a parking lot. Why not 80th? You get the picture. I commute through this neighbourhood regularly, and the only decent bike trails going the same direction are six blocks to the north or south, and both end just as abruptly as 83rd Avenue. Bicycle infrastructure in Edmonton is getting better. The new bike corrals in Old Strathcona and the bike box intersection experiment will both make it safer and more convenient to get around. But by and large, traffic planning takes bikes into account as a distant afterthought. Patchwork bike routes that leave you staring at a set of train tracks push cyclists onto more dangerous roads that actually go somewhere. Wide painted lanes for bikes, or separated bike paths, would make it safer and easier to get around. Some cities have even found fast, safe ways to clear bikes quickly from intersections without making roads any wider. The most agonizing part of any tragedy is that its ingredients are visible from the start. Isaak Kornelsen did not have to die biking down Whyte Ave, but the factors that create dangerous situations like his are obvious. And they’re still there. A Critical Mass bike ride in memory of Isaak will begin at City Hall on Friday, August 31st at 5:30 PM.